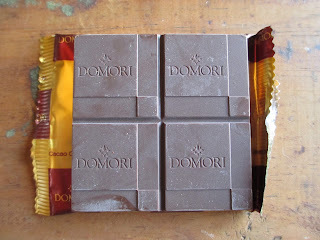 Once home, I found myself wondering why, out of all the chocolate bars for sale at Kakawa Chocolate House in Santa Fe, I had chosen one from Domori (also one from Pralus, which I'll review later). The thing is, I think I confused the name with something I once got from World Market and felt neutral toward--but on further review, it seems that I've never come across Domori after all. My instincts, then, on choosing this bar of chocolate out of the bunch were right on par. Domori is an Italian company, and the look of their packaging implies elegance and quality. The card box is textured like handmade paper, with the sides shining in gold. The touch of red, in addition to the gold, adds refinement, while the soft sketch of cocoa pods adds softness and a sense of history. The cocoa content, 70%, of this chocolate is average. The type of cocoa, however, is not. 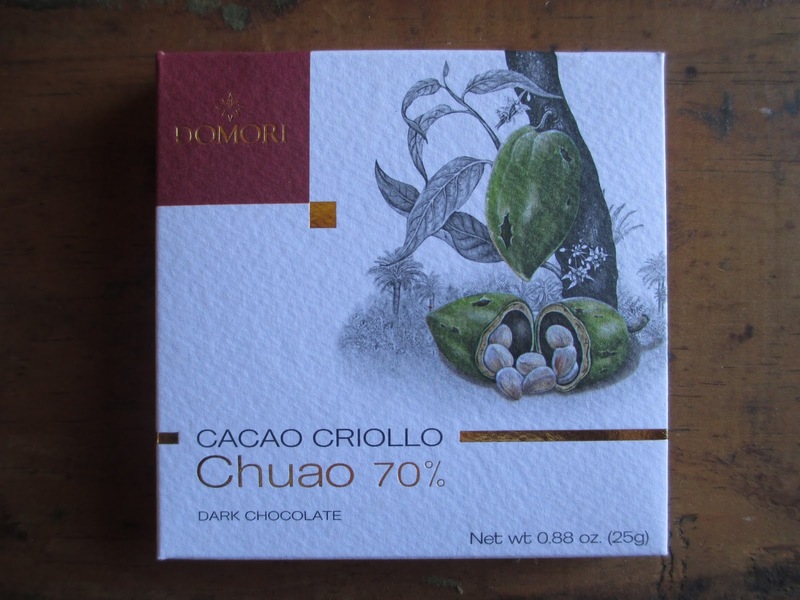 This chocolate is made with Criollo beans from Chuao in Venezuela; Chuao cocoa beans are generally considered the absolute best. Amano's Chuao is the one that immediately comes to my mind--while it was amazing, though, I could never decide if it was my favorite of their bars (all of Amano's chocolate is wonderful). 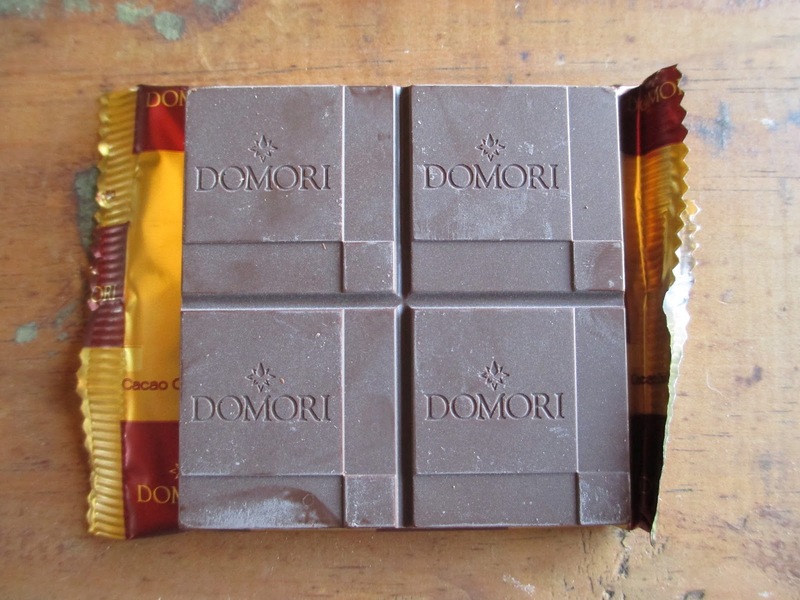 Also somewhat out of the ordinary for Domori's bar is the two ingredient list: cocoa and cane sugar, no vanilla. That speaks to confidence: exceptional chocolate needs no vanilla. As I opened the square card box, I almost thought that there was a mistake: it felt empty. Inside is just a little wrapper with a thin, four square bar inside. It's a 0.88 oz./25 gram bar. There was some very light bloom but nothing to be concerned about. The chocolate aroma is nice and smooth, light and elegant. The initial taste is sweet, then almost bitter, then it becomes nice and deep. There are blue notes of cocoa nibs, then what I like to call silver flavor. The coolness starts warming up as the chocolate melts. A hint of spiciness comes in as you pass the halfway point. Neither thin nor dusty, the mouthfeel is smooth and rich. The taste, too, is an extremely rich taste of medium dark chocolate flavor. A slightly spicy aftertaste lingers after the chocolate melts. Absolutely amazing. This is one of the best chocolates I've ever had. For comparison, the notes on the packaging are as follows: "An immediate perception of nuts, almonds above all, followed by honey, vanilla and cream: great sweetness and smoothness." Yes, I didn't use the word sweetness because it has negative connotations when it comes to chocolate, but it was there, and I definitely noticed the sweetness. The honey and vanilla I can see. And you know something? This chocolate tastes very familiar, as if I know it but can't remember from where I know it. Perhaps it reminds me of other Chuao bars I've had (I think there might have been one other besides Amano's but I can't think of it right now). This doesn't really matter, though, because this chocolate completely won me over. Great flavors and very well handled as far as texture and everything else. You see, my dears, this is chocolate, and this is why other products are sweets, not chocolate. This is gourmet.